Pagan Lucky Charms - they're magic(k)ally delicious! 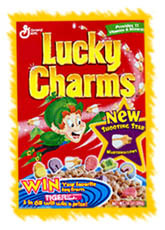 Lucky charms is the perfect cereal for Pagans!!! think about it, what does it have? Clovers for earth (and plant magick/herbalism), moons for air (and astrology), stars for fire (and also astrology) and blue for water (diamonds could be stone magick or earth). Bear with me here, it's a tiny leap of faith at the start). Then they added pink hearts (spirit) and purple horseshoes (animal magick). and "magic crystal balls" - they change color in the center to show a picture when you put them in milk - i think the symbolism of a crystal ball does not need explaining! the oats are shaped like bells (tho i don't see books or candles! ), fish (kind of like an ichthus, which may have been a later attempt to pacify xian cereal eaters), clovers and xes (again, to pacify the xiana). Actually, i just now noticed that they are the same basic shapes as CAT FOOD. for more on what's behind lucky charm's advertising, visit this random site i found through ask jeeves.